Greetings everyone! I've been working like a beast for the last 18 months on a whole new line of products...Emma Purple Aromatics. This line features incense & perfume/cologne oils made from organic and wild-harvested plant extracts, with absolutely nothing synthetic. I named it after my half-Cherokee great-great grandmother, Emma Purple McCaul. The inspiration for this new line grew from my 8 years (and counting) of work and study as an herbalist. Organic & wild-harvested plants yield numerous medicinal benefits, providing healthy substances which positively effect the physical, mental and emotional realms of our lives. Synthetic fragrances are chemical cocktails that have a negative impact on health & well-being, and bear none of the aromatic complexity evident in plants. That is why I began this new adventure: to give folks safe, lovely aromatic options which delightfully evoke the aromatic nuances of the field and the forest. I've been making skin healing salves for 6 years. This foray into good aromatics is a salve for the spirit. All of my perfumes are made with only organic & wild-harvested plants and plant extracts in a base of organic golden jojoba oil. The essential oils used are only CO2 & hydro-distilled. I do not use any that are extracted with harmful solvents (like hexane). They come to you in a 5 ml glass bottle, packaged in a lovely gift box filled with organic and wild-harvested aromatic plants. The aromatic plants may be burned as an incense on a charcoal incense tablet, for an extra sensory treat. Charcoals are available on the Emma Purple Aromatics website. There is also a sampler set available, if you want to try a little of all of them. The incense I make is called kyphi incense, referring to a process of incense-making that was perfected in Egypt thousands of years ago. It involves infusing aromatic herbs, flowers, roots, resins, barks & berries in a base of honey & wine. It is then formed into bricks and cured for several weeks. To burn, simply break a pea-size amount from one of the bricks, and burn on a charcoal incense tablet. My incense contains only organic & wild-harvested plant material, with wine and local desert honeys. It comes to you in a gift box, enclosed with a satin ribbon. Emma Purple Aromatics has a lovely website. Click here to visit it. I've also set up a Facebook page for it. Please go give it some love. And, as always, feel free to leave a comment below with any questions or observations you may have. People often ask me, "If there was only one thing I could do (or take) to improve my health, what would it be?" The answer, though often a noticeable let-down, is simple, extremely practical, and doesn't require a magic pill. "Get consistently good sleep." In this post, I'll be covering the reasons why sleep is so important, simple tips for improving your sleep, and herbs to help you along the way. In the industrialized nations and particularly in the US, the average amount of sleep we get per night has drastically decreased in the last hundred years. According to herbalist Paul Bergner, in 1910 people slept 9 hours per night, on average. Today, the average is 7 hours during the workweek, and fewer than 8 hours on the weekend. One-third of the population gets under 6 hours of sleep per night, while only one-third sleeps at least 8 hours. In our cultural context of focus on work and productivity, we've become a nation of the sleep deprived, and overlook the most basic form of self-nourishment. It is generally recognized that sleep deprivation causes the break-down both the mind and the body. With so many folks not getting enough sleep, it certainly makes you wonder how our communities, and our world as a whole, are affected. Why is sleep so important? The reasons are numerous. - Impaired performance of mental and physical tasks. Memory is also impaired, motivation is reduced and it becomes more difficult to learn new things. Risk for accidents also increases. - Increased risk for depression. - Impaired cardiovascular health. The tendency for blood to clot increases, as do triglyceride levels. There is also an increase in the risk for high blood pressure, irregular heartbeat, stroke and heart attack. - Increased secretion of certain thyroid hormones, which is indicative of thyroid stimulation. Long-term stimulation of the thyroid can lead to thyroid disease. - Depressed growth hormone production. Growth hormone promotes tissue regeneration and immune system health, as well as healing and repair of lean body mass. - Increased risk for obesity. - Increased cortisol secretion. Cortisol is a stress-related hormone. - Impaired immune function, especially of the immune components responsible for fighting viral infection and cancer. - Impaired glucose tolerance & possible increased risk for diabetes. This is just the tip of the iceberg, really. Truth be told, we still don't completely understand all of the reasons why we sleep. Scientifically, we're still learning a lot about sleep. - Don't stay up late and cut into your sleep time. Go to bed early enough to get at least 8 hours of sleep. - Eat dinner at least 3 hours before going to bed. Food will increase your body's metabolism, which can keep you awake. Avoid sugar in the evening. Avoid caffeine after 3 or 4 pm - or all together if you find yourself particularly sensitive to stimulants. - Go outside and get some sunshine during the day. This will help your body set a natural rhythm of melatonin production. Melatonin is the hormone responsible for our sleep cycles. - Keep your room dark and cool at night. Any light source will disrupt melatonin production. - Avoiding mentally or emotionally strenuous activity before bed (like watching the news) will help you relax into sleep. - Use your room only for sleeping. Never do work in your room, even during the day. This will help program your brain that your bedroom is for resting, not work. - Identify your hidden passion. If you had unlimited funds and resources, what would you do with your time? Immerse yourself in your passion before you go to sleep. If you like painting, paint a bit, or look at an art book. If you like cooking, plan out an awesome recipe, or look at a cook book. I like plants, so every night I read an herbal materia medica, put on an aromatic plant-infused balm or perfume & look at a wildflower guide before I go to sleep. I find that a nourished spirit lends to a restful body. It also is food for the dream world. There are many herbs with varying sedative properties. While the list below is by no means exhaustive, these are the herbs I have the most experience with. They are available in capsule, liquid tinctures and teas. When taking herbs for insomnia, I prefer to use a liquid form (tincture or tea), because they absorb and act more quickly. Many people find it most effective to take part of the dose 1/2 an hour before bed and the rest at bedtime. 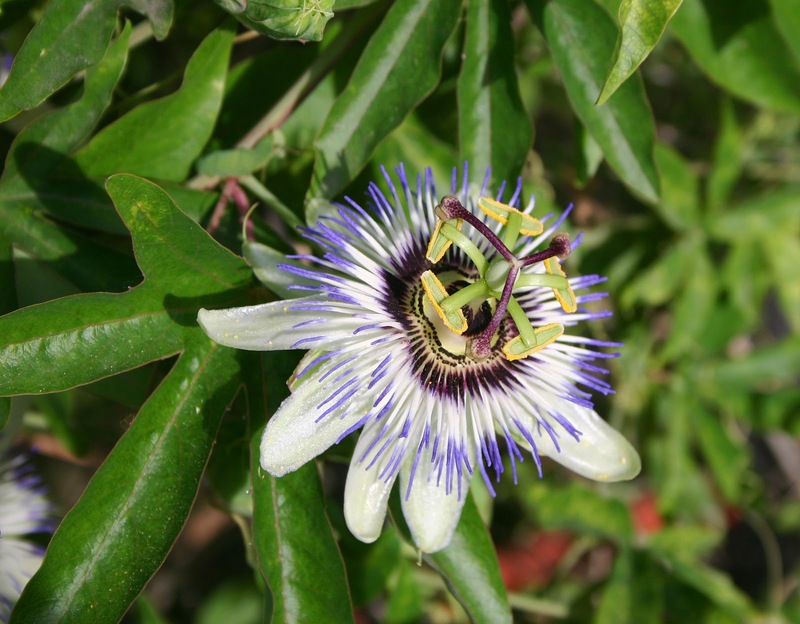 Passionflower is one of my favorite relaxant herbs. It's best for insomnia due to mental activity... a busy mind. When your body is ready for sleep but your mind isn't quite there, if you lay in bed with thoughts going round and round in your head, then passionflower can help. In my experience, it doesn't make all the thoughts go away, it just makes them more peripheral and they don't have as much consequence. I've used passionflower to quiet the re-visitation of the 80's hair band song that I heard at a store earlier in the day, or the brain noise that worry can sometimes produce. Passionflower doesn't produce feelings of grogginess in the morning. In fact, it can be used during the day time for nervousness and anxiety. Skullcap is calming to the nervous system, so it's great for nights when you are feeling twitchy and restless. It helps the body relax, easing the tension that sometimes contributes to insomnia. It can also serve to reduce mild nerve pain and muscle spasms. California poppy is great for insomnia due to pain. I've used it for pain due to cramps, as well as pain from a day that was rougher than usual on my physical body. 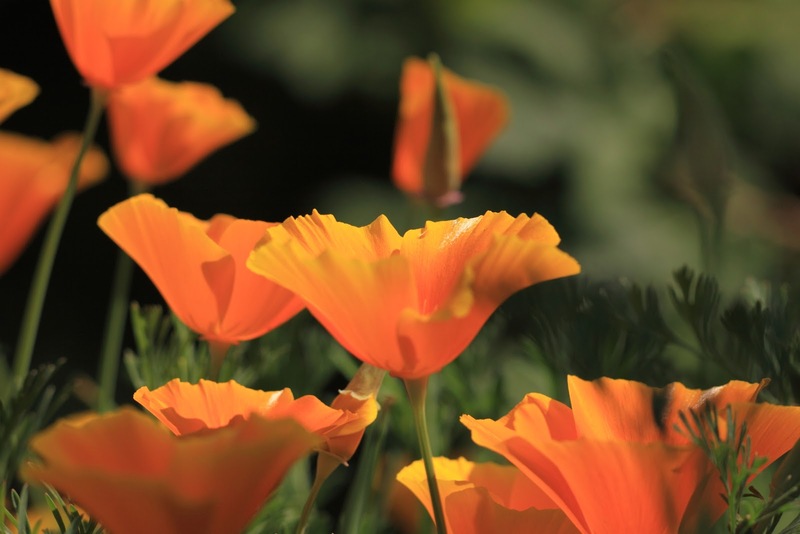 California poppy is also great for those who wake frequently, finding it difficult to sleep through the night. It supports deeper, and more consistent sleep. 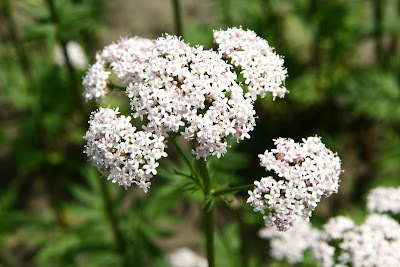 Valerian is a pretty straight-forward sedative. It's hugely popular for this purpose and can be helpful in overcoming insomnia due to pain or general tension, and improve the quality of sleep. However, in about 10% of people, it can actually make insomnia worse. This can be mitigated by using a tincture prepared from the fresh plant, which seems to produce this effect less often. When I use it, I take it in blends with other sedative herbs. While magnesium is a mineral, not an herb, it's definitely great for sleep problems. A vast array of the body's processes rely on magnesium. It's estimated that up to 80% of Americans are deficient in this vital mineral. Notably, magnesium is a muscle relaxer, so overly-tense muscles can be a sign of deficiency. If you wake with leg cramps at night, or if you grind your teeth, magnesium is a great place to start. Moore, Michael. Medicinal Plants of the Mountain West. Santa Fe: Museum of New Mexico Press, 2003. Wood, Matthew. The Earthwise Herbal: A Complete Guide to New World Medicinal Plants. Berkeley: North Atlantic, 2009.